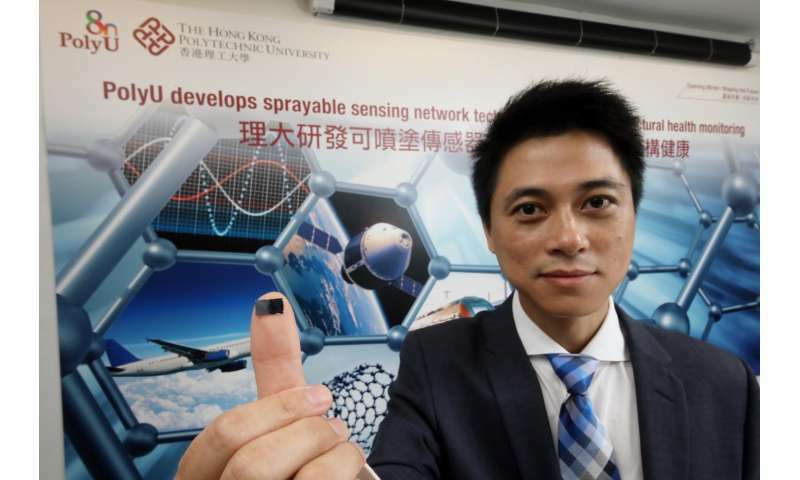 The Hong Kong Polytechnic University (PolyU) research team developed a novel breed of nanocomposites-inspired sensors which can be sprayed directly on flat or curved engineering structural surfaces, such as train tracks and aeroplane structures. The sprayed sensors can be networked, to render rich real-time information on the health status of the structure under monitoring. Due to its light weight and low fabrication cost, large quantities of sensors can be deployed in a sensor network for detecting hidden flaws of structures, paving the way for a new era of ultrasonics-based structural health monitoring. The nanocomposite sensors developed by the research team from PolyU's Department of Mechanical Engineering, led by Professor Su Zhongqing and Professor Zhou Limin, adopt an innovative technique of fabrication through spraying which makes installation process for sensors much faster and more efficient compared with conventional means. It also enhances the flexibility of the product to adapt to various types of surface. Currently, the number of conventional ultrasound sensors, such as those made of lead zirconate titanate (PZT), used for in-situ monitoring is usually limited by the factors related to the sensor's cost and weight. These sensors are usually stiff (unwieldy to adapting to curved structural surfaces), introducing remarkable weight and volume penalty to a host structure to which the sensor is to be mounted. The nanocomposite sensors developed by the team, however, can be fabricated in large quantities to form a dense sensor network for structural health monitoring at a much lower fabrication cost and weight than using conventional sensors. "This nanocomposite sensor has blazed a trail for implementing in-situ sensing for vibration, or ultrasonic wave-based structural health monitoring, by striking a balance between 'sensing cost', i.e. the cost of sensors, and 'sensing effectiveness', the quantity of data acquired by the sensors," said Professor Su. PolyU's innovative sensing technology encompasses a sensor network with a number of the sprayed nanocomposite sensors and an ultrasound actuator, to actively detect the health condition of the structure to which they are fixed, quickly and accurately showing if there is any damage in the structure. When the ultrasound actuator emits guided ultrasonic waves (GUWs), the sensors will receive and measure the waves. If damage, such as a crack is present in the structure, propagation of GUWs will be interfered by the damage, leading to unique wave scattering phenomena, to be captured by the sensor network. Based on wave scattering, the damage can be characterized quantitatively and accurately via an all-in-one system that was developed by the team. Compared to the conventional ultrasound sensors which costs over US$10 each and weighs few grams, this new breed of nanocomposite sensor costs only US$0.5 and 0.04g for each. As such more sensors can be adopted in one structure, generating more information for analysis, with less weight added to the structure. In addition, Professor Su's sensor has excellent flexibility and can adapt to curved structure surfaces. That allows a wide range of practical engineering applications. It is also sprayable on the surface of a moving structure to transmit the structural health information in a real-time manner. The sensor developed by the team can measure an ultrasound signal from static to up to 900 kHz yet with ultralow magnitude. The acquisition of wave scattering in an ultrasonic regime allows detection of cracks as small as 1 to 2 mm in most engineering materials. That response frequency is over 400 times more than the highest frequency than nanocomposite sensors that are reportedly available (as reported in international journals). While conventional ultrasound sensor can measure a wider range of ultrasound waves when compared to those developed by the team, the high cost and weight of the conventional sensors make a large quantity application infeasible, limiting the quantity of data acquired. There are lots of limitations in applying the conventional ultrasound sensors to practical applications, especially in aerospace structures. Made of a hybrid of carbon black (CB), 2D graphene, conductive nano-scale particles, and polyvinylidene fluoride (PVDF), the nanocomposite sensor can be easily and flexibly tailored to different sizes towards various engineering applications. The secret of its high sensitivity to structural change lies in the optimized nanostructure of the hybrid, which endows the sensor to possess an ability to identify the dramatic changes in piezoresistivity of the nanocomposite. To measure and analyse the dramatic change of piezoresistivity, Professor Su and his team tested numerously on the weight ratio of nanofillers in order to optimize the conductivity of the nanocomposite. Each sensor is connected to a network via a wire printed on the structure. By analyzing and comparing the electrical signals converted from the electric resistivity, the network can spot the defect in a structure, as well as translate the signals into 3D images. This new research has recently been published in top-tier journals in this field, including Ultrasonics, Carbon, and Smart Materials and Structures. "Due to its light weight, the novel nanocomposite sensors can be applied to moving structures like trains and aeroplanes. That will help to pave the way for real-time monitoring of these structures in future, enhancing safety of the engineering assets and retrofit the traditional system maintenance philosophy," said Professor Su.